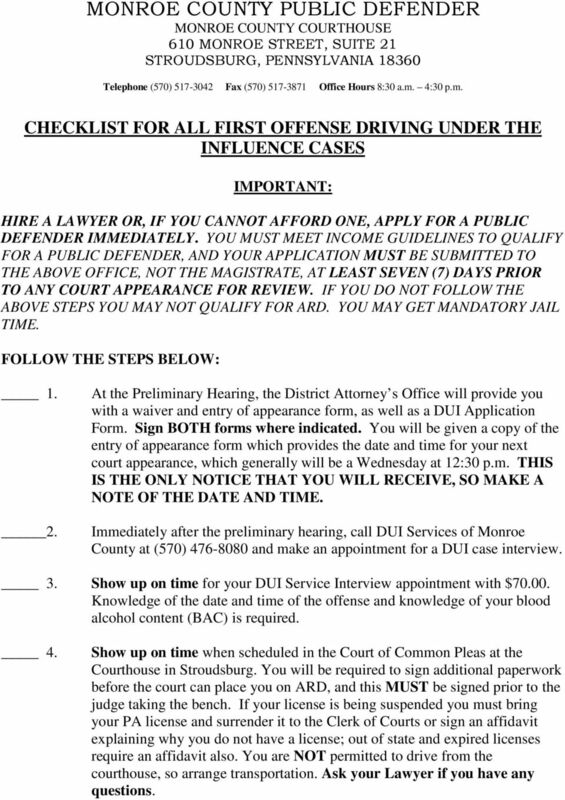 Download "MONROE COUNTY PUBLIC DEFENDER MONROE COUNTY COURTHOUSE 610 MONROE STREET, SUITE 21 STROUDSBURG, PENNSYLVANIA 18360"
1 CHECKLIST FOR ALL FIRST OFFENSE DRIVING UNDER THE INFLUENCE CASES IMPORTANT: HIRE A LAWYER OR, IF YOU CANNOT AFFORD ONE, APPLY FOR A PUBLIC DEFENDER IMMEDIATELY. YOU MUST MEET INCOME GUIDELINES TO QUALIFY FOR A PUBLIC DEFENDER, AND YOUR APPLICATION MUST BE SUBMITTED TO THE ABOVE OFFICE, NOT THE MAGISTRATE, AT LEAST SEVEN (7) DAYS PRIOR TO ANY COURT APPEARANCE FOR REVIEW. IF YOU DO NOT FOLLOW THE ABOVE STEPS YOU MAY NOT QUALIFY FOR ARD. YOU MAY GET MANDATORY JAIL TIME. FOLLOW THE STEPS BELOW: At the Preliminary Hearing, the District Attorney s Office will provide you with a waiver and entry of appearance form, as well as a DUI Application Form. Sign BOTH forms where indicated. You will be given a copy of the entry of appearance form which provides the date and time for your next court appearance, which generally will be a Wednesday at 12:30 p.m. THIS IS THE ONLY NOTICE THAT YOU WILL RECEIVE, SO MAKE A NOTE OF THE DATE AND TIME. Immediately after the preliminary hearing, call DUI Services of Monroe County at (570) and make an appointment for a DUI case interview. 3. Show up on time for your DUI Service Interview appointment with $ Knowledge of the date and time of the offense and knowledge of your blood alcohol content (BAC) is required. 4. Show up on time when scheduled in the Court of Common Pleas at the Courthouse in Stroudsburg. You will be required to sign additional paperwork before the court can place you on ARD, and this MUST be signed prior to the judge taking the bench. If your license is being suspended you must bring your PA license and surrender it to the Clerk of Courts or sign an affidavit explaining why you do not have a license; out of state and expired licenses require an affidavit also. You are NOT permitted to drive from the courthouse, so arrange transportation. Ask your Lawyer if you have any questions. 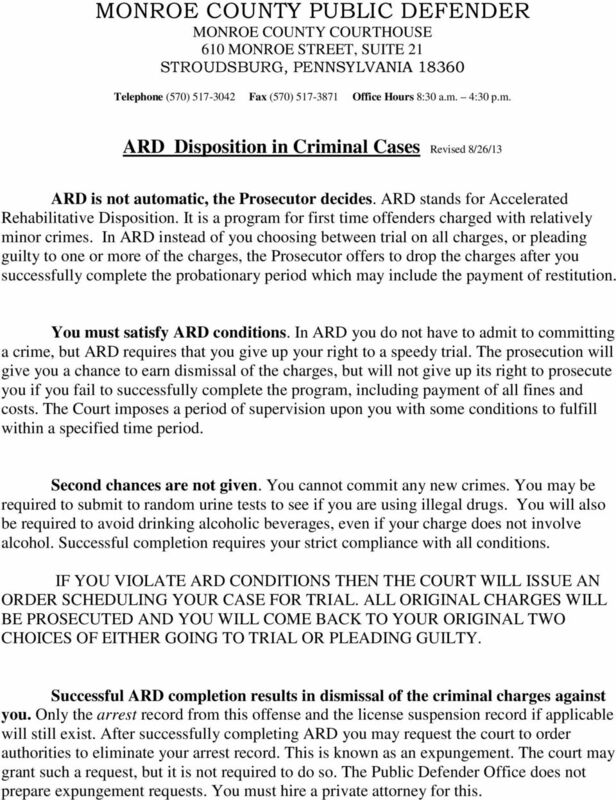 2 ARD Disposition in Criminal Cases Revised 8/26/13 ARD is not automatic, the Prosecutor decides. ARD stands for Accelerated Rehabilitative Disposition. It is a program for first time offenders charged with relatively minor crimes. In ARD instead of you choosing between trial on all charges, or pleading guilty to one or more of the charges, the Prosecutor offers to drop the charges after you successfully complete the probationary period which may include the payment of restitution. You must satisfy ARD conditions. In ARD you do not have to admit to committing a crime, but ARD requires that you give up your right to a speedy trial. The prosecution will give you a chance to earn dismissal of the charges, but will not give up its right to prosecute you if you fail to successfully complete the program, including payment of all fines and costs. The Court imposes a period of supervision upon you with some conditions to fulfill within a specified time period. Second chances are not given. You cannot commit any new crimes. You may be required to submit to random urine tests to see if you are using illegal drugs. You will also be required to avoid drinking alcoholic beverages, even if your charge does not involve alcohol. Successful completion requires your strict compliance with all conditions. IF YOU VIOLATE ARD CONDITIONS THEN THE COURT WILL ISSUE AN ORDER SCHEDULING YOUR CASE FOR TRIAL. ALL ORIGINAL CHARGES WILL BE PROSECUTED AND YOU WILL COME BACK TO YOUR ORIGINAL TWO CHOICES OF EITHER GOING TO TRIAL OR PLEADING GUILTY. Successful ARD completion results in dismissal of the criminal charges against you. Only the arrest record from this offense and the license suspension record if applicable will still exist. After successfully completing ARD you may request the court to order authorities to eliminate your arrest record. This is known as an expungement. The court may grant such a request, but it is not required to do so. The Public Defender Office does not prepare expungement requests. You must hire a private attorney for this. 3 ARD Special Aspects in Driving Under the Influence (DUI) Cases You cannot get ARD in any of the following situations: 1. You were found guilty of DUI or accepted ARD on a DUI charge in PA or any other state within the ten years before your current DUI offense. 2. You caused an accident where someone else was killed or suffered serious bodily injury as a result of the accident. 3. A passenger under 14 years of age was in the vehicle you were driving. ARD probation is six months in length. 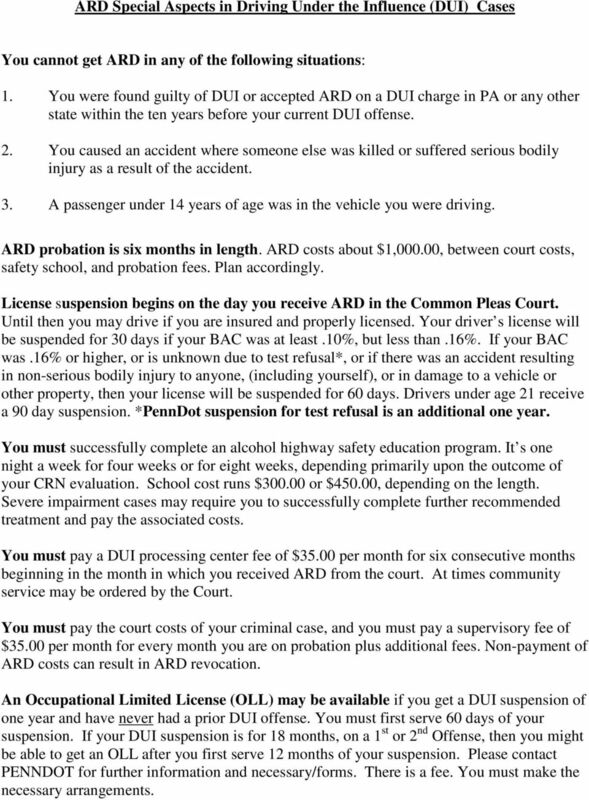 ARD costs about $1,000.00, between court costs, safety school, and probation fees. Plan accordingly. License suspension begins on the day you receive ARD in the Common Pleas Court. Until then you may drive if you are insured and properly licensed. Your driver s license will be suspended for 30 days if your BAC was at least.10%, but less than.16%. If your BAC was.16% or higher, or is unknown due to test refusal*, or if there was an accident resulting in non-serious bodily injury to anyone, (including yourself), or in damage to a vehicle or other property, then your license will be suspended for 60 days. Drivers under age 21 receive a 90 day suspension. *PennDot suspension for test refusal is an additional one year. You must successfully complete an alcohol highway safety education program. It s one night a week for four weeks or for eight weeks, depending primarily upon the outcome of your CRN evaluation. School cost runs $ or $450.00, depending on the length. Severe impairment cases may require you to successfully complete further recommended treatment and pay the associated costs. You must pay a DUI processing center fee of $35.00 per month for six consecutive months beginning in the month in which you received ARD from the court. At times community service may be ordered by the Court. You must pay the court costs of your criminal case, and you must pay a supervisory fee of $35.00 per month for every month you are on probation plus additional fees. Non-payment of ARD costs can result in ARD revocation. An Occupational Limited License (OLL) may be available if you get a DUI suspension of one year and have never had a prior DUI offense. You must first serve 60 days of your suspension. If your DUI suspension is for 18 months, on a 1 st or 2 nd Offense, then you might be able to get an OLL after you first serve 12 months of your suspension. Please contact PENNDOT for further information and necessary/forms. There is a fee. You must make the necessary arrangements. 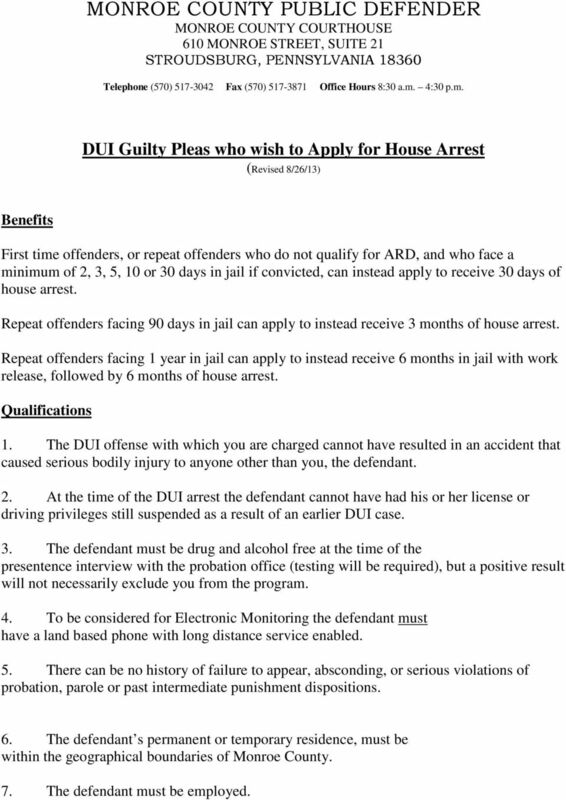 4 DUI Guilty Pleas who wish to Apply for House Arrest (Revised 8/26/13) Benefits First time offenders, or repeat offenders who do not qualify for ARD, and who face a minimum of 2, 3, 5, 10 or 30 days in jail if convicted, can instead apply to receive 30 days of house arrest. Repeat offenders facing 90 days in jail can apply to instead receive 3 months of house arrest. Repeat offenders facing 1 year in jail can apply to instead receive 6 months in jail with work release, followed by 6 months of house arrest. Qualifications 1. The DUI offense with which you are charged cannot have resulted in an accident that caused serious bodily injury to anyone other than you, the defendant. 2. At the time of the DUI arrest the defendant cannot have had his or her license or driving privileges still suspended as a result of an earlier DUI case. 3. The defendant must be drug and alcohol free at the time of the presentence interview with the probation office (testing will be required), but a positive result will not necessarily exclude you from the program. 4. To be considered for Electronic Monitoring the defendant must have a land based phone with long distance service enabled. 5. There can be no history of failure to appear, absconding, or serious violations of probation, parole or past intermediate punishment dispositions. 6. The defendant s permanent or temporary residence, must be within the geographical boundaries of Monroe County. 7. The defendant must be employed. 5 What You Must do to get House Arrest 1. Plead guilty at the DUI Call of the List and make an appointment for a presentence interview with the Monroe County Probation Department. 2. You must phone DUI Services of Monroe County at within 15 days of preliminary hearing to set up CRN evaluation, and abide by treatment recommendations while under supervision. 3. You must pay the $10.00 per day Electronic Monitoring fee ($ for 30 days, $ for 90 days) on or before your court date, which usually occurs within 30 days of today s waiver of preliminary hearing. All defendants who choose to participate in the House Arrest Electronic Monitoring Program must understand that this is an alternative to incarceration and is not guaranteed. If you test positive for drugs and/or alcohol at the time you report for hook up, you will be violated and immediately taken to the jail to await re-sentencing. 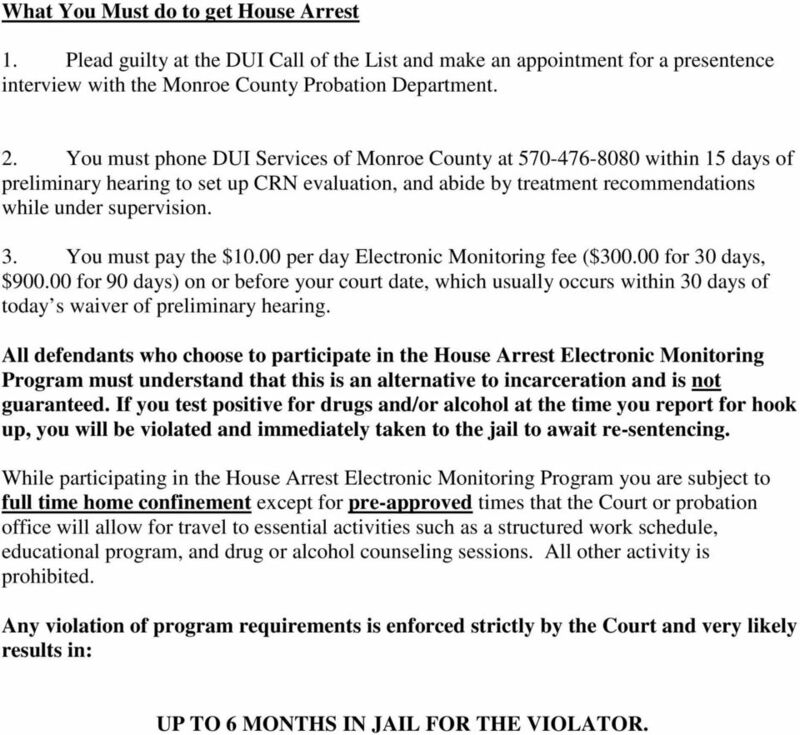 While participating in the House Arrest Electronic Monitoring Program you are subject to full time home confinement except for pre-approved times that the Court or probation office will allow for travel to essential activities such as a structured work schedule, educational program, and drug or alcohol counseling sessions. All other activity is prohibited. Any violation of program requirements is enforced strictly by the Court and very likely results in: UP TO 6 MONTHS IN JAIL FOR THE VIOLATOR.